Two words that probably describe Maurer’s designs the best are whimsical and magical. His works always seem to have a narrative about them and a certain ability to draw you in. Facing Maurer’s designs it is easy to forget that the object you are encountering is a lamp or a lighting device / installation. The infinite imagination present in Maurer’s work is not the solely thing he should be praised for. Maybe even more the ability to create such work and still keep it as simple and minimalistic as possible, always trying to reduce the material usage to the bare necessity. What makes it possible for Maurer to create in this manner, is also the fact that he was a pioneer in applying contemporary discoveries in light technology to his designs. First with the introduction of the halogen bulb and later the LED as well. Ingo Maurer’s work is thus characterized with a wit, humor and easiness only a light magician like him can achieve. Ingo Maurer [born May 12 1932 in Reichenau Germany] is an industrial designer who devoted his career to light, light design and light installations. 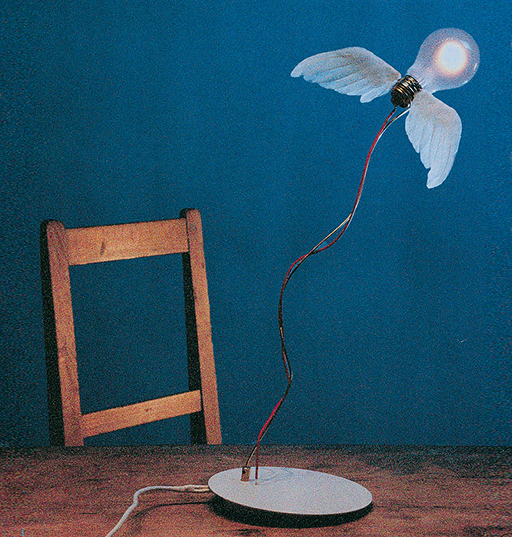 One of the examples of such wittiness is certainly his work Lucellino, the standing lamp from 1992. 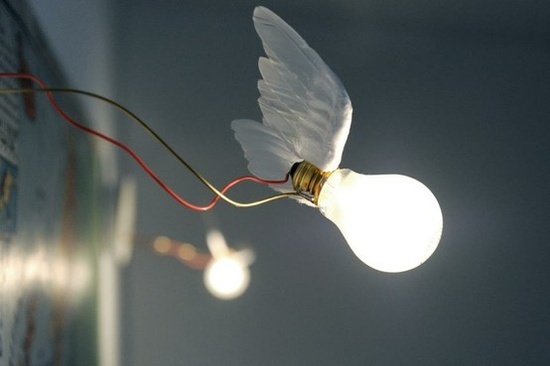 The usage of the material is visibly scarce, yet only a bulb, a wire, a metal stem and a pair of goose feather wings are enough to create this almost alive-like lamp creature. Seeing Lucellino in the Stedelijk it was evident that it will be my item of choice, as I, myself, have always been inexplicably attracted to light and light emitting bodies. What also attracted me to Lucellino was its animalistic quality of embodying a bird-like creature (hence the name – luce = light, ucellino = small bird ) which made it easy for me to connect with this object. Its playful charm makes it more than just a lamp but rather an object that almost has an intelligence of its own.